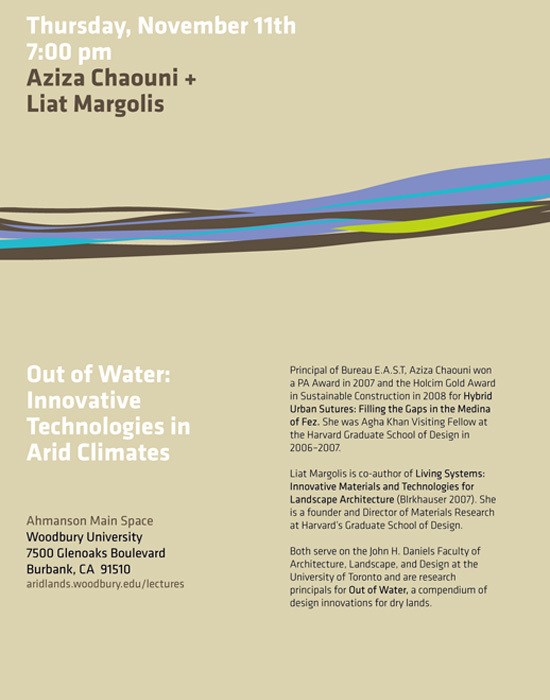 If you're around Burbank, CA, this Thursday, November 11, and are interested in arid water systems, then consider attending a lecture by Aziza Chaouni and Liat Margolis at the Arid Lands Institute, Woodbury University. Titled Out of Water: Innovative Technologies in Arid Climates, they will cover recent research projects in Morocco, the Sahara, and the Israel/Jordan/Palestine watershed that showcase contemporary design strategies for managing water scarcity. If you can't make it, there is still their Out of Water website. It archives some of the projects included in their traveling exhibition and no doubt will be featured in their lecture. Their talk, meanwhile, is part of a very interesting lecture series. The human need for water has ordered landscapes, given rise to culture, and shaped architecture + urban form throughout history. In this pioneering study of the water infrastructure of Renaissance Rome, urban historian Katherine Rinne offers a new understanding of how technological and scientific developments in aqueduct and fountain architecture helped turn a medieval backwater into the preeminent city of early modern Europe. Supported by the author’s extensive topographical research, this book presents a unified vision of the city that links improvements to public and private water systems with political, religious, and social change. Between 1560 and 1630, in a spectacular burst of urban renewal, Rome’s religious and civil authorities sponsored the construction of aqueducts, private and public fountains for drinking, washing, and industry, and the magnificent ceremonial fountains that are Rome’s glory. Tying together the technological, sociopolitical, and artistic questions that faced the designers during an age of turmoil in which the Catholic Church found its authority threatened and the infrastructure of the city was in a state of decay, Rinne shows how these public works projects transformed Rome in a successful marriage of innovative engineering and strategic urban planning. The speaker scheduled for next week is Morna Livingston, author of a book on Indian stepwells. From the fifth to the nineteenth centuries, the people of western India built stone cisterns to collect the water of the monsoon rains and keep it accessible for the remaining dry months of the year. These magnificent structures—known as stepwells or stepped ponds—are much more than utilitarian reservoirs. Their lattice-like walls, carved columns, decorated towers, and intricate sculpture make them exceptional architecture, while their very presence tells much about the region's ecology and history. For these past 500 years, stepwells have been an integral part of western Indian communities as sites for drinking, washing, and bathing, as well as for colorful festivals and sacred rituals. Steps to Water traces the fascinating history of stepwells, from their Hindu origins, to their zenith during Muslim rule, and eventual decline under British occupation. It also reflects on their current use, preservation, and place in Indian communities. In stunning color and quadtone photographs and drawings, Steps to Water reveals the depth of the stepwells' beauty and their intricate details, and serves as a lens on these fascinating cultural and architectural monuments. A “magnificent architectural solution to the seasonality of the water supply” in India they may be, but our favorite use for them is as the stage for the spectacular death scene of Charles Darwin, the naturalist, and Wallace, his companion monkey and fellow lepidopterist. 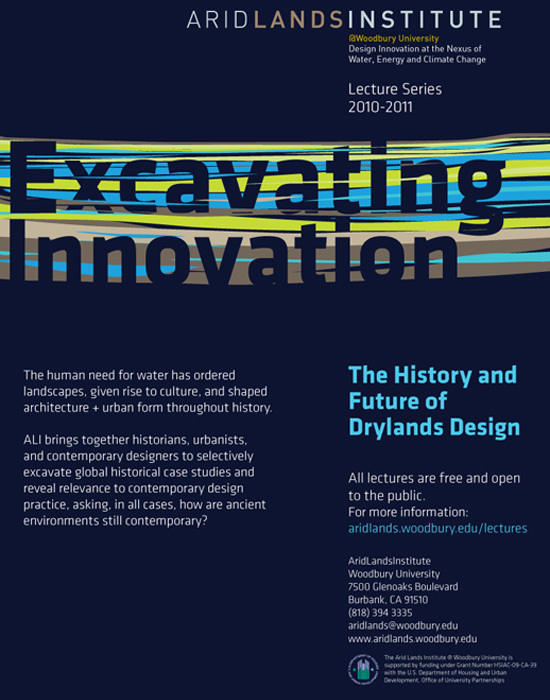 The titles of the other two scheduled lectures, Canalscape: Ancient and Contemporary Infrastructures of Phoenix and Indigenous Infrastructure and the Urban Water Crisis: Perspectives from Asia, make us wish they were going to be streamed online.